The East Coast Economic Region Development Council (ECERDC) is a statutory body established to spearhead the execution and implementation of the East Coast Economic Region (ECER) Master Plan. ECERDC plays a lead role in setting the directions, policies and strategies for the socio-economic development of ECER by promoting and facilitating investments into the Region. ECER, which covers the states of Kelantan, Terengganu, Pahang and the district of Mersing in Johor, is a rapidly transforming region that is steadily positioning itself as a distinctive, dynamic and competitive destination for investments. 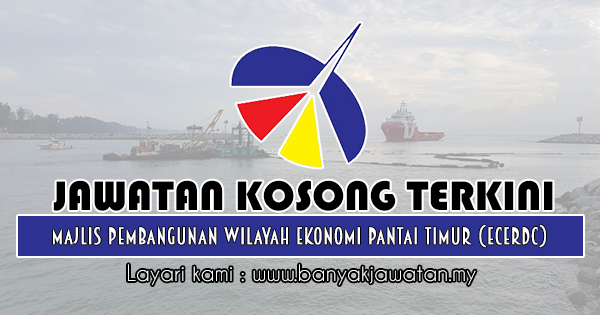 0 Response to "Jawatan Kosong di Majlis Pembangunan Wilayah Ekonomi Pantai Timur (ECERDC) - 2 Januari 2019"